What Kind of City is Hell? City of Dis: An Investigation. Like every country, Hell has a capital: the City of Dis. Conceived by Dante, its name comes from the Ancient Roman Father or God of the Underworld, Dis Pater. Dis is believed to have originated from the Latin word dives or wealthy, which in turn finds its etymological roots in deus, god and dīvus, divine. According to Cicero, this leads us directly to ploutōn, or Pluto, Ancient Greek for wealth, and the name of the Greco-Roman God of the Underworld. This emphasis on wealth is not coincidental. The Earth’s crust hid deep dark mysteries (hell and magic), but it also held out bright prospects (diamonds, minerals and metals), and was therefore rife with temptation. Western culture and the Christian religion in particular had a complex relationship with forbidden knowledge: what the earth concealed, was invisible to the naked eye for good reason. Dig too deep and you were asking for trouble. Antonio Manetti, Circles Six and Seven, 1506 edition. PJ Mode Collection of Persuasive Cartography, Cornell. 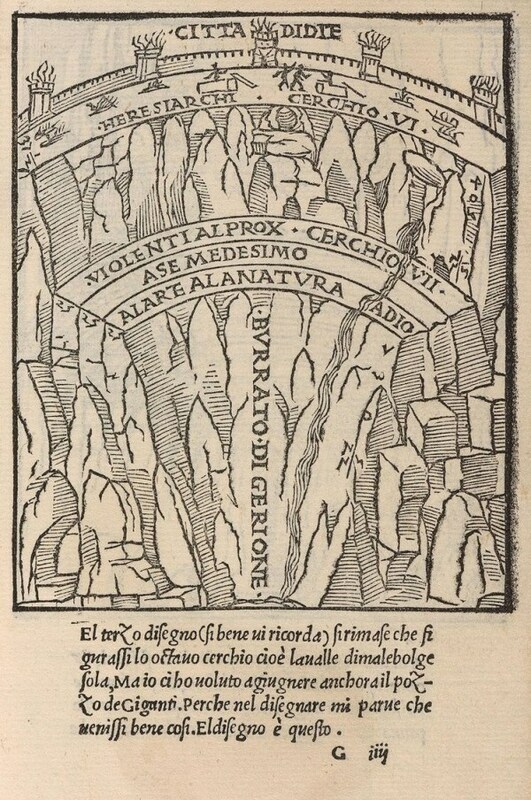 In the Divine Comedy, Dante and Virgil journey through Hell’s first five circles before reaching Dis, which vertically expands through Hell’s deepest circles and marks the beginning of Lower Hell. Its gates are guarded by both mythological and Christian figures of evil: the three Furies, Medusa, and several Fallen Angels. It is clear from Virgil’s pallor and stuttering remarks that few have ever ventured this deep into the earth’s bowels. The path to Hell is easy—both physically and metaphorically; the real difficulty lies in ‘getting the hell out.’ As he stands facing the gates of Dis, this thought weighs upon Dante more profoundly than ever. Like many earthly cities, Dis is fortified by a wall and bordered by a river: a fortress located halfway to the center of the earth. The river Styx is more like a swamp and is filled with the agonizing bodies of sinners who try desperately to climb onto the boat that is taking Dante and Virgil toward the city walls. 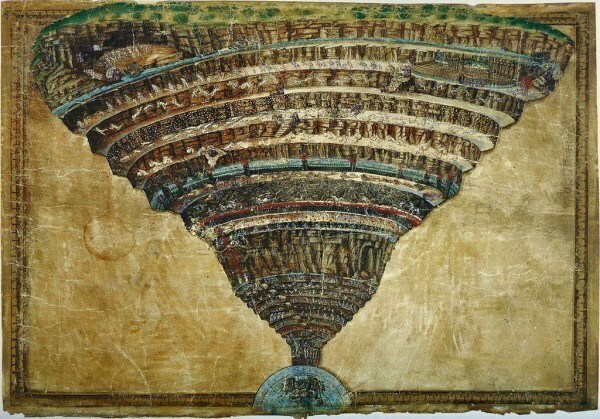 According to Dante, Hell is shaped like an inverse cone, penetrating the earth down to its exact center. Although it can be reached through numerous gateways, Hell’s core lies 1,700 Florentine Miles (2,811 modern kilometers) directly below the city of Jerusalem, the center of the inhabited world. The actual distance from the crust to the earth’s center is 6,371 km. Galileo Galilei compared this cone to an amphitheater, which, instead of opening onto a piazza, culminates precisely at Lucifer’s belly button. 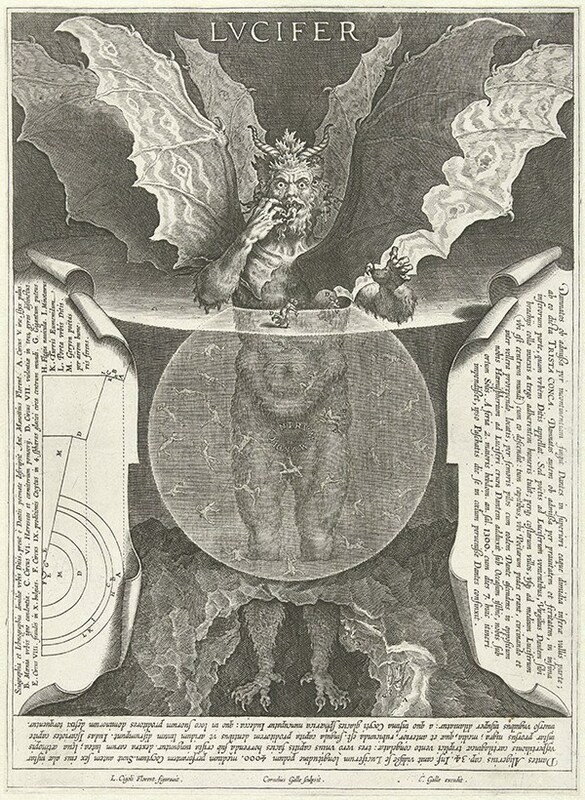 With the help of the few numbers provided by Dante and the calculations of Antonio Manetti, a fifteenth-century Florentine architect, Galilei was able to confidently apply his mathematical prowess to the measurement of Hell and beyond. For instance, he went so far as to calculate the dimensions of Lucifer himself, from which he was able to discern the size of the Earth. Dis’ smell is “prodigious.” We can only imagine what that may be like. Today’s reader might think of something more familiar, the putrid fumes that emerge from New York’s manhole covers come to mind. 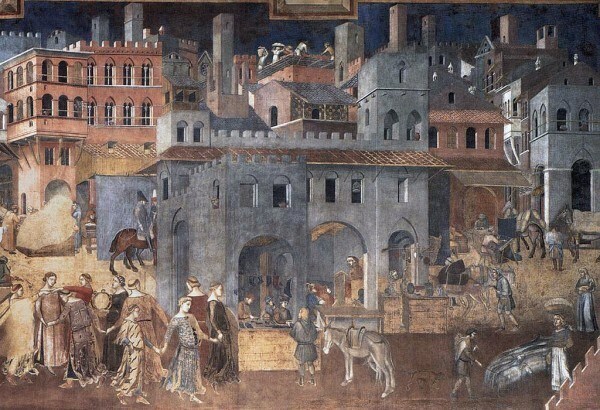 Each era has its very own ‘hells.’ In Dante’s time and the centuries that followed cities were certainly less clean than today. During the periodic epidemics it was not uncommon to see death spill into the streets. Take for example Naples in 1685: a French priest, Jean Mabillon, visited the city and wrote in his diary that the women with ruffled hair and sunken faces gave “l’idee de la mort.” The seventeenth century seems to have been especially unfortunate. In 1631, Vesuvius suddenly erupted for the first time since 79 A.D. In 1656, only twenty-five years later the city was struck by plague. In 1685, it struck again. Descriptions are of a city full of corpses: left in the grottos of the hills, in the early Christian catacombs, piled inside mass graves, abandoned in the piazze and thrown into the sea. Literature of all kinds emerged in the years following the epidemics: simple accounts of events that took place, epic novels, medical and scientific investigations, and apocalyptic religious treatises. When Mabillion visited in 1685, Naples was still licking its wounds. Hell was not difficult to imagine. This was also the period of the Inquisition, and new instruments of torture were being designed and put to use regularly. 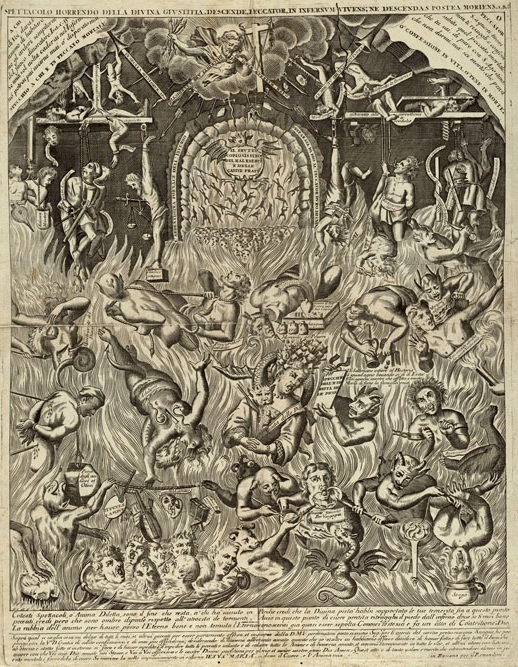 It is hardly surprising that prints of hell during the seventeenth century resemble a fiery city scattered with the instruments of torture and populated with sinners of all kinds: courtesans, gluttons, lavishly dressed materialists. What makes Dis seem urban, in its various incarnations, was not so much the usual attributes of a city, buildings and streets—actually these are not represented—but rather its stench, its dense population, the city walls, and the noise. In Dante’s Comedy, the wall also serves as a landmark and a barrier to differentiate Lower from Upper Hell, and thus those being punished for sins of malice from those punished for sins of passion. Malice implies ill will and is therefore far worse than passion, which the poet saw as an involuntary weakness. Dis and its walls, like Hell’s circles, serve as reminders of Dante’s moral system. In Hell, geography and morality are deeply intertwined. Sandro Botticelli, Chart of Hell, ca. 1480-1490, Vatican Library. It helps to look at some of the artistic interpretations of Dante’s Comedy that were aided by Manetti and Galielo’s calculations. Sandro Botticelli, who only had Manetti’s work as a basis, took some liberties, placing Dis at the far right corner of Hell’s cone. Here, Dis is circular and majestic; its water looks more like it might belong in the garden of earthly delights than in Hell. Botticelli was not happy with just one wall: there are six circular fortresses stacked onto one another, each with two towers. It seems, time and again, that the important thing when interpreting hell is to take earthly forms and exaggerate them, twist them into something familiar yet absurd and uncanny. Despite his fear and hesitation, Dante makes it into Dis and down to the ninth circle of Hell where he and Virgil find a portentous Lucifer with part of his frozen body buried in the earth. The two poets climb out of Hell using Lucifer’s upside down legs as a ladder until they reach the path that will take them to Purgatory. In spite of Dante’s choosing Dis as the name of the city in his medieval Hell, there are no material riches here. In completing the downward journey in order to once again rise and reach the light of day, however, the poet touches upon Hell’s fraught relationship with wealth, though of a different kind: the wealth of knowledge. To illustrate this, think back to his journey: in circle eight Dante had traveled far into Dis. He had heard Ulysses’ tale of his “restless itch to rove and rummage through the world,” and upon hearing this, the poet found himself gripping a rock in a sudden effort not to fall into the dark abyss below. 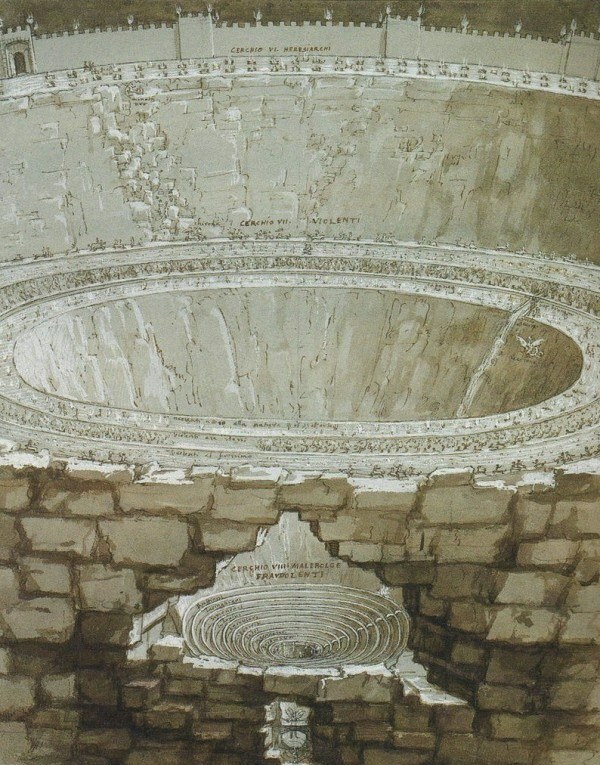 Dante had recognized himself in the words of the Greek hero because, after all, there was an element of vain curiosity that had driven him further and further into the bowels of the earth. No and yes, yes and no, yes. But in choosing the name Dis, Dante may have been simply poking fun at those who would ultimately end up there. Piero Camporesi, one of Hell’s most prolific and avid scholars wrote: “descriptions of impossible revenge and of inhuman delight in the complete destruction of the sinner were indissolubly linked to the place of punishment.” In other words there is no hell without Hell. We might go so far as to say that there is no city without Dis looming over our collective imagination.